My family and I are fine. We have power, running water, and Internet. Many are not so lucky. Dozens lost their lives. Millions are without power. Billions will be spent repairing the damage. Sandy won't be soon forgotten. Register to donate money, goods, services, or time. The Times is providing free unlimited access to storm coverage on nytimes.com and its mobile apps. The Atlantic has some photos. That second photo is from the street outside of Studiomates in Dumbo, where I work. Dumbo was hit pretty hard. 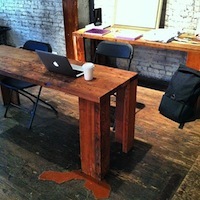 The Galapagos Art Space was flooded, as was Bubby's, One Girl Cookies, Power House Books, and others. Jane's Carousel looked like an island during the storm. The Dumbo Improvement District has set up a site to help Dumbo businesses rebuild. Tina is raising money to help the Galapagos Art Space rebuild. Before the storm hit, Oak set up a camera at Studiomates to capture it. They also made a time lapse. If you need a place to work today, the Invisible Dog is open. We have tables, chairs, and hot coffee. You are welcome to come! I couldn't ask for a better place to work while we all try to get back on our feet.